In a meeting today with West Virginia Eastern Panhandle legislators, highway officials discussed multiple highway issues affecting the Eastern Panhandle area. In response from an inquiry from Delegate Larry D. Kump, legislators were told that that the highway department now is in the process of reviewing the need for an upgrade of Rt. 9 between Martinsburg and Berkeley Springs. Highway officials further agreed to Kump's request to look into the need for a traffic signal at the intersection of Rt. 11 and Grade Road in the Marlowe/Falling Waters area. Among other issues, highway officials also reported that the widening of I-81 is progressing and that Maryland now is working on the design to widen the I-81 bridge between Maryland and West Virginia (Maryland "owns" the Potomac River and has proprietary jurisdiction over the I-81 bridge). I'm impressed with Larry D. Kump's initiatives to "shake-up" the establishment with fresh, innovative ideas that disturb the status quo and quid pro quo style of government that we have endured during the past decades. As a Kanawha County resident, I wish that I could secede from the regressive and oppressive style of party-philandering, rhetoric bombing, and nonsense that has permeated the statehouse for years and only lead to further recessive measures with respect to our economy and business climate. With all the challenges that we face in our state, the best that we can get is 1% repeal of sale's tax on groceries? This is more of a political ploy than a corrective measure - with "business as usual" in a state that "is open for business". LARRY KUMP FOR GOVERNOR - 2011 and beyond with a self-imposed limitation to not become a career politician! HB 2481 "None of the Above"
This gives voters the option to choose "None of the Above" on election day. If you aren't happy with the candidates on the ballot, but still want to vote and also want to let the candidates know that you don't like any of them, just vote for "None of the Above". Tired of the "same old-same old" from our mainstream political parties? This legislative proposal requires elections in West Virginia to be non-partisan and not based on political party affiliation (the same as our elections for School Boards). This West Virginia Constitutional Amendment sets a twelve year limit of serving in office for all West Virginia Delegates and Senators, so that serving in the Legislature remains a citizen duty and not a means for a legislative career. Further, I also am co-sponsoring HB 2866 "The Patriot Protection Act", to protect citizens' rights to fly the American flag and prohibit landlords and homeowners associations from denying this patriotic right. Also, the West Virginia House of Delegates Constitutional Revision Committee, on which I serve, currently is in the process of wading through numerous proposals to increase the Homestead Exemption to property taxes for senior citizens. With the West Virginia Supreme Court confirming the necessity of a special election for Governor, some politicos are calling for a Convention to select nominees, instead of a Primary election. Inasmuch as a Convention would usurp the right of citizens to have a direct vote on the political parties nominees for Governor and turn it over to the good ol' boys, I have joined others in the West Virginia House of Delegates in sponsoring HB 2552, to require a Primary election. Other proposals which I am supporting are the elimination of the West Virginia tax on groceries, personal property taxes on vehicles, social security payments, and home heating fuel. Furthermore, within the West Virginia House of Delegates Constitutional Review Committee, I and other Delegates will be reviewing proposals to increase the Homestead Exemption Tax Credit for senior citizens. More to come on this and other issues to come, including legislation to prohibit landlords and homeowners associations from denying citizens the right to fly a standard size or smaller American flag (or historic American flag) at their residences. 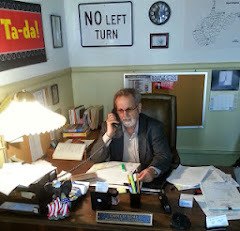 In reaction to the first week of the 2011 West Virginia Legislature, Delegate Larry D. Kump (R-Morgan & Berkeley Counties) remarked that "Most folks in West Virginia remain concerned about the drumbeat of claims that West Virginia government is in good shape, because their own personal and family situations continue to be at risk." "Our friends and neighbors continue to struggle to make ends meet, and it is not unusual for either or both husband and wife to be working more than one job. Single parents are under even more stress", said the Eastern Panhandle legislator. He went on to point out that "most folks just want to be able to get on with their lives without government making their personal and family situations worse. To that end, they are looking for government that helps enhance their economic opportunities and freedom of choice as well as increases governmental accountability and transparency". On another legislative issue, Kump confessed that he is "greatly troubled by public officials who continue to dodge a special election for Governor by insisting that voters are tired of elections. Those elected officials who try to delay our Constitutional duty and responsibility to ensure that our Governor is elected by the people do us a grave disservice. Those who are 'tired of elections' have the right to decline to participate at the polling places, but elected officials have taken an oath of office to preserve the right of the people to choose their leaders".